For kids: Help build a giant spider web! 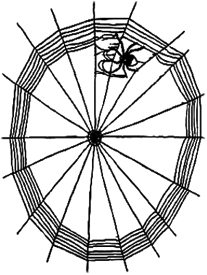 Learn about and make one of nature’s intricate designs: the spider web! Meet at the Thoreau house replica near the parking lot. All are welcome! Children must be accompanied by an adult. This is a free program, but there is a parking fee of $8 per vehicle with Massachusetts plates, $10 with non-Massachusetts plates. No dogs are permitted unless they are working guides. Park programs are sponsored by MA-DCR. For more information, call (978) 369-3254. This entry was posted on September 24, 2015 at 12:07 pm and is filed under 10_15 Public Programs, Interpretive Programs. You can follow any responses to this entry through the RSS 2.0 feed. Both comments and pings are currently closed.